We announce a new Team Member! Officers of the College of Charleston Delta Gamma Sorority pose during a presentation with Dixie Land Secretary/Treasurer Laurel Jean, Vice President Audrey Gunter and Audrey's new guide, Jesse. Master Jesse Gunter, a handsome 2 year old yellow lab was delivered to his new mom, (and our Vice President) Audrey on the afternoon of Thursday, November 11, 2010. The bond began almost immediately as the two lived, played and worked together at the Florida campus and training facilities of Southeastern Guide Dogs. Audrey had labored over the decision of when she should retire her first guide, Zack, also a Southeastern boy. Those two had shared the past 8 years as an inseparable team as they traveled all across the USA on business and in Ministry. Indeed, it was Zack who first led Audrey to God, literally and figuratively, leaving a positive public image wherever they went! 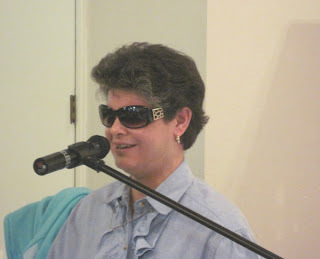 Whether lobbying for a new guide dog protection law; creating an ADA-compliant policy for an upstate hospital; teaching sensitivity and awareness to a school, business or organization; or sharing their testimony to an attentive church congregation, theirs was a unique team of devotion, intelligence and commitment. Zack's steps had begun to slow down back in 2009, but Audrey attributed his altered speed to his adjusting to her hip and leg injury. When Zack began to illustrate difficulty upon boarding a car, Audrey knew it was time for him to spend his time playing ball and holding down the sofa, which he is doing extremely well. Jesse, a loving, yet lively young pup, continues to endear himself to his new mom daily. Despite the fact the two have been together for less than 3 months, the trainers at Southeastern proclaim they work together as though they'd been together for years. Jesse loves to work and he loves the praise his mom gives him every time he does something right, which is all the time. When not working, you can find Jesse playing with "Mr. Squeakers", his blue rubber bone; chewing on one of his many chew bones; playing tug with his big brother or just sitting in his mom's lap as the two curl up together in their recliner, with Zack nearby on the sofa. Dinner in the Dark-An Eye-Opening Experience! 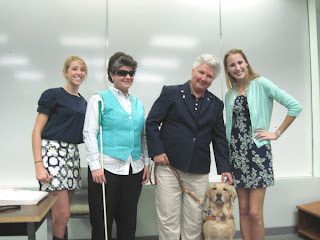 Dixie Land President, Nancy Moore and Vice President, Audrey Gunter, pose with blind youth of the Lowcountry (Shelby, Taylor and Brianna). 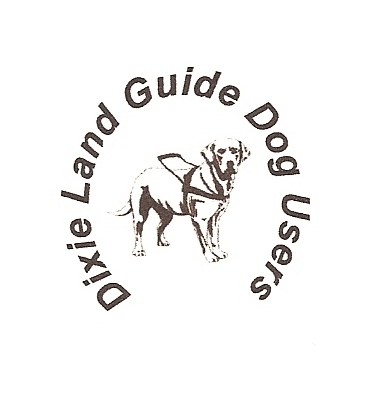 Dixie Land Guide Dog Users coupled with the many ministries of Grace United Methodist Church and Music by Laurel Jean and sponsored by the Association for the Blind, worked together for a very successful evening of food, music, fellowship, entertainment and awareness. 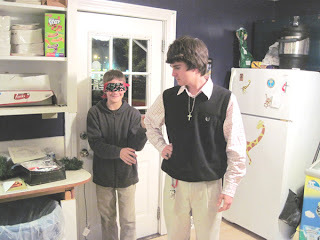 Grace youth learn to be sighted guides as part of their orientation for Dinner In The Dark. Happy, helpful volunteers met our guests at the door with blindfolds (prepared by some of Grace's Circle Clubs) and bibs (prepared by Grace's Youth). Pre-trained sighted guides then escorted the blindfolded public to their tables where they were served a delicious dinner of spaghetti, salad, garlic bread and banana pudding, (all prepared by Chuck Heller and the United Methodist Men). Dixie Land's Secretary/Treasurer, Laurel Jean delighted everyone with her music and quips. She even included some of the kids she serves with her Chaplaincy for Blind Youth. Brianna was quite a hit on her violin and Shelby and Taylor amazed our diners with their vocals. Here, Taylor entertains our guests, accompanied by Laurel and assisted by Grace Youth Director, Bruce Philpott. Some folks really got into the spirit of the evening and continued the ordeal of trying to eat by touch. Some could only handle a few minutes of eating while blindfolded. Some gave up on using utensils and began shoveling the spaghetti strands in their opened mouths with their sauce-covered fingers. All had a great time and walked out with a new-found understanding of some of the challenges the blindness community confronts daily. Indeed, our "Dinner in the Dark" has accomplished the original goal of being an awareness-raiser; yet, with all the laughter and jubilant faces, apparently it was also a "fun" raiser as well. "Paws" to Educate at Top Dog, Orlando!